Note: BitIRA does not currently offer EOS IRAs, though it may in the future. Currently, other crypto IRA types are available. Transaction speed. Bitcoin processes about 7 transactions per second while Ethereum processes about 20 transactions per second. These rates are low and cause delays. Transaction fees. Bitcoin and Ethereum rely on fees charged to users for every transaction so that miners have an incentive to verify it. Scalability. As Bitcoin and Ethereum become more popular, slow speeds and higher fees put a strain on the blockchain, making widespread adoption more difficult. Can these problems be resolved? Is there a cryptocurrency that processes transactions at significantly higher speeds and with no fees? Yes, It’s called EOS, created by block.one. EOS is a cryptocurrency that runs on the EOS.IO blockchain protocol developed by the private company, block.one. Designed to have similar features to Ethereum, EOS addresses Ethereum’s problem of scalability head-on. For this reason, EOS has been called the “Ethereum Killer” by some analysts. The co-founder and CTO of block.one, computer scientist Daniel Latimer, has had a track record of successful crypto ventures — such as BitShares and Steemit — before creating EOS. Block.one also envisioned EOS to be the first cryptocurrency with its own constitution. By June 2018, less than a year after the EOS white paper was released, EOS had raised $4 billion from its token sale and $50 million for app development on the EOS.IO ecosystem. Delegated Proof-of-Stake (DPoS). Daniel Latimer is also the creator of the DPoS algorithm, which allows for EOS’s improvements over Bitcoin and Ethereum. More transactions per second. DPoS, unlike Bitcoin PoW and Ethereum’s PoS algorithms, allows EOS to process 3,000 transactions per second (i.e. 150x faster). Elimination of transaction fees. EOS has zero transaction fees, a major innovation. Mass scalability. With faster transactions and no fees, EOS is ready for widespread adoption. Smart contracts. Like Ethereum, parties can enter into contracts with EOS that are fulfilled automatically only when pre-agreed-upon conditions are met. Agile development changes. Fixes and updates with EOS are much easier to implement than with Ethereum. Distributed applications (DApps). EOS creates a platform for application development (similar to Ethereum) that supports many programming languages. Those that see long-term promise in a cryptocurrency may want to purchase it for their individual retirement account (IRA). BitIRA currently does not offer an EOS token option for an IRA, but you can learn more about the types of cryptocurrencies offered in Digital IRAs by BitIRA. Diversification. A greater range of assets can be held in a Self-Directed IRA account, including cryptocurrency, precious metals, and others. Independent decision-making. Rather than others allocating the assets in your retirement account, a Self-Directed IRA gives you the freedom to choose these yourself. Multiple IRAs. Don’t forget that individuals can have multiple IRAs. A crypto IRA can be one of several retirement accounts as part of a diverse asset strategy. Compliance responsibility. With greater freedom comes more responsibility. By law, the investor has the burden of compliance when it comes to purchasing SDIRA assets. Prohibited assets. Cryptocurrency can be held in a Self-Directed IRA. There are other types of assets that can’t be part of an SDIRA (for example, property used for personal purposes). Lack of liquidity. Trades within an IRA happen without a penalty. Funds withdrawn from an IRA before qualifying retirement age, though, can be heavily penalized by the government. 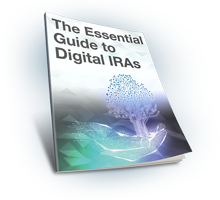 For more information about Self-Directed IRAs, see our Self-Directed IRA and Bitcoin guide. The IRS treats cryptocurrency as property for tax purposes. This means that when trades are made in a taxable environment, you must meticulously document every transaction so taxes can be assessed accurately. With a crypto IRA, however, cryptocurrency transactions do not have the same reporting requirements. This is because the IRS assesses income tax on funds in an IRA only when a distribution takes place (Traditional IRA) or when a contribution is made (Roth IRA). While crypto IRAs are particularly suited for a “HODL” (buy and hold) strategy, you can trade cryptocurrency for other types of assets (and vice-versa) as many times as you would like within the umbrella of a Self-Directed IRA. All SDIRAs, including Digital IRAs, still require you to manage your retirement wealth through a custodian. There are advantages to this when it comes to cryptocurrency. Qualified custodians specializing in cryptocurrency may offer security measures such as cold wallets, multi-signature keys, personal hardware devices, and vault storage. Some even fully insure the cryptocurrency assets in your IRA. Financial service companies, like BitIRA, can help with the rollover and cryptocurrency purchasing processes. BitIRA does not currently offer EOS IRAs, but if you are interested in learning about other types of crypto IRAs, call (800) 299-1567. Outlook for EOS: What’s Next? Everipedia. A fork of Wikipedia on the EOS blockchain that seeks to bypass the restrictions placed on Wikipedia in several countries around the globe. Huobi Exchange. A Singapore-based cryptocurrency exchange that processes about $1 billion in daily transactions will be launching the first EOS exchange in Q1 of 2019. With many investors and an active developer community, the outlook for EOS looks bright. The EOS token is one of several promising digital currencies on the market today. While an EOS IRA is currently unavailable, BitIRA does offer other cryptocurrency IRA options, including Bitcoin IRAs and Ripple IRAs. If you want to be the first to know if EOS IRAs will be offered by BitIRA, or to learn more about crypto IRAs, request a free info guide here.